This is an extract from a copy of The Constitution of the United States of America: Analysis and Interpretation/2010 Supplement, S. Doc. No. 111-39, at 4 nn.2 & 5, 55 (Kenneth R. Thomas et al. eds., 2010) (prepared by the Congressional Research Service and Library of Congress) (citing Textualist). The document is available from the Government Printing Office and available at http://works.bepress.com/seth_barrett_tillman/274/. 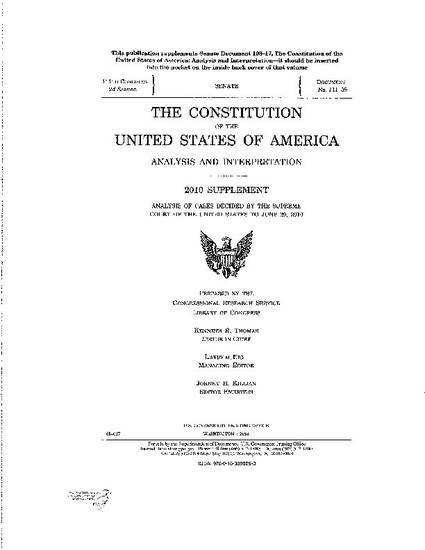 The Constitution of the United States of America: Analysis and Interpretation/2010 Supplement, S. Doc. No. 111-39, at 4 nn.2 & 5, 55 (Kenneth R. Thomas et al. eds., 2011) (prepared by the Congressional Research Service and Library of Congress) (citing Textualist), available at http://works.bepress.com/seth_barrett_tillman/274/.